In today's world with its recent economical shift for the worst such as high gas prices, reduce in salaries, and lay-offs, many Americans are opening their own small business. Whether its building an online fashion store to providing a service, many small business owners will try to attempt the designing of their business logo or brand. They do this to cut costs thinking that doing it themselves is the cheapest way to go. Well, if it smells cheap, looks cheap, then it is cheap. Keep in mind, the company's logo identity is the public's first impression of the business. These are preliminary compositions of the logo. Later, you will see a more refined look when applied to the business card layout which will include more color but not overly done. My advice to small business owners is to look at your internal resources - family, friends, co-workers, etc. Hire a professional graphic designer that creates outstanding branding. If you don't have the overhead to pay for a strong designed brand, check your local college, university, or art school and see if there are any graduating students who would be willing to design your brand for free. In return, the student will have a professional printed piece for their required graduation portfolio. But beware, not every graduating art student is outstanding. Find one who knows how to design well, create files for the printing process, and even website design. You'd be surprised what you find in these art students. Below is a sample of a brand that I recently created for my business associate, Michael Greene - makeup artist extraordinaire. When he first started his business he could only afford a basic template for his business card. So, AfallaStudios decided to reach out and help brand his amazing business. Congratulations Michael on your new brand! His old business card said a lot about his style and taste so I played off of Michael's style. The colors on his original business card had organic ribbon-like patterns, old-age wood carved designs, and his primary color was burgundy. Instead of copying the exact style, we went ahead and customized a logo that complimented the font that was chosen for his name. We also played with words in which his clients would relate to: "I WANT Michael Greene to do my makeup. I HAVE to have Michael Green to do my makeup. I NEED Michael Greene to do my makeup". Having said that, we only used the one words to stir up an emotion. This is where our marketing expertise comes in and when we presented this so called "Tagline" to describe his business, he immediately fell in love with the concept. Then we decided to make it look like one word BUT distinguished each word by changing the weight of the font. By doing this, it would be easier for the audience to read each word separately. The preliminary composition layout when brand is applied. Although this sample shows a full spectrum of how the brand is being applied (i.e. 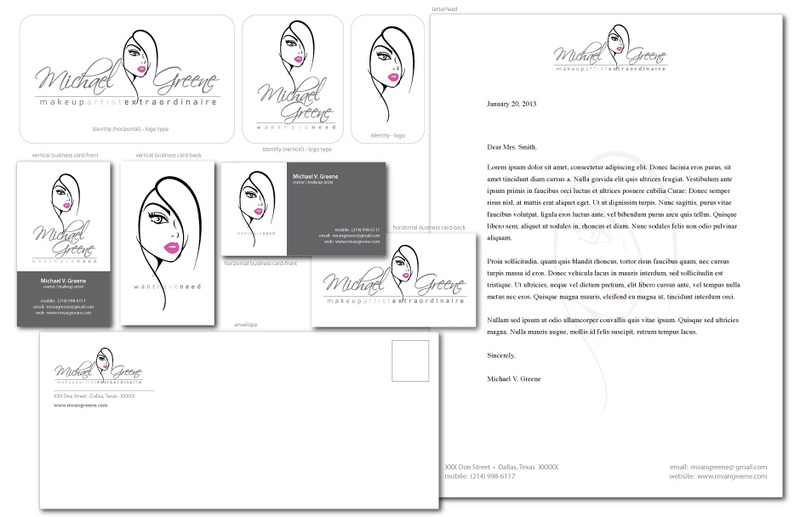 business card, letterhead, envelope), most clients would start out with just business cards at first. In the end, we studied color and only wanted the lips to be painted to focus on makeup. We also incorporated the color green for the last name "Greene" and used a green to pink gradient to represent the color spectrum that one would see on a pallet of eye shadows for example. Giving the design a hint of gray, toned the entire business card layout, however, we kept the female figure's lines black to make the logo jump out and contrast with everything else. We are very happy to create this for Michael and look forward to the official 'roll-out' of his logo to his clients when he starts handing out his new business card. And if you haven't experienced his amazing work, why not book him into your new photo shoot with AfallaStudios? Again, congratulations to Michael Greene on a successful new and improved branded logo. This is the final business card layout design which was approved by the client. Notice how the designer played with color and play off the word "Greene" using the color green effectively. The designer also added a gradient color which resembles colors from an eye shadow makeup tray.